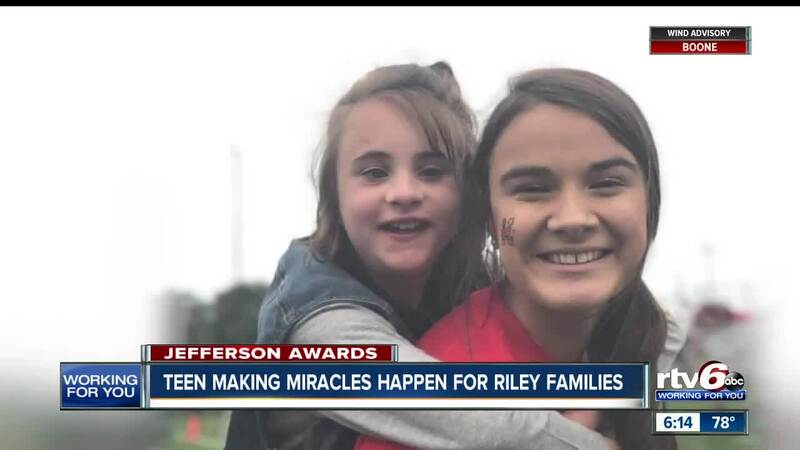 Jefferson Awards: Teen making miracles happen for Riley families. AVON — Those impacted by RTV6's Jefferson Award winner says she has a "heart of gold." A neighboring family's life experiences touched the 16-year-old recipient from Avon so much that she has made it her mission to do good for not only their two children living with disabilities but all Riley kids. Hundreds attend, dozens of patients and volunteers are involved and there always a slew of guest appearances from the community at the annual dance marathon for the Riley Hospital for Children. Behind it all is a sophomore from Avon High School, Emma Clark. A determined dancer who is passionate about making Riley families lives a little bit better. Clark's dedication stemmed from a love for one of the families in her neighborhood. The Gibson kids, 13-year-old Makenna, and 10-year-old Maison, often call Riley Hospital home. But when they are actually at home, their neighbor, Clark, is right there. Emma being a big sister to Makenna and Maison does not go unnoticed by the kids' parents. "They adore her. She is always there; she goes with Mason to adaptive sports camps to help him. She is right there with him, just being his buddy to help him out," Traci Gibson, Maison and Makenna's mom, said. "Makenna struggles with a lot of different things. And she [Clark] is just so patient and kind with them; she just has a heart of gold." The Gibson's journey touched Clark's heart so much that she started an organization two years ago in their honor and support, called "Moving for Miracles." The two "m's" are symbolic for Makenna and Maison. "The fact that she is so young and that she has started this organization and dedicates so many hours and months to put this on just because she has a heart for these kiddos, you just really can't put it into words," Gibson said. In March, Clark presented a $4,500 check to Riley Hospital. Making it even more special, was the presentation of "The Riley Wagons" with her organization's name on it. "The Riley wagons are a really important part of any Riley family's journey," Clark said. "Having one with Moving for Miracle's name on it - It's just amazing. I can't even put it into words." And during all this fun at Riley, RTV6 had something for Clark, as well. The newsroom presented Clark with a Jefferson Award Medal that Maison awarded to her. "... So proud. My little girl cares more about other people and trying to make them smile, and make this world a better place," Holly Clark, Emma Clark's mom, said. "Not for her own glory, but just to see them happy."